After a second trip to BareBurger last night, Crystal and I paid a visit to Terrizzi Pasticceria for a sweet finish. I was in the mood for gelato and heard that it was quite excellent here. After we walked in, gelato wasn't the only thing on our minds, as we admired Terrizzi's sweet offering of gooey cupcakes, chocolate fudge mice, mini-pastries, cookies, cakes and so much more. Despite the temptation of enticing treats, we stuck to our original plan--getting frozen desserts. I ordered a hazelnut gelato and Crystal opted for the chocolate ices. Both were scrumptious, refreshing, and tasted uncompromisingly homemade. The hazelnut gelato was not only creamy and decadent, it also contained crunchy pieces of hazelnuts, which made it more authentic and slightly rustic. 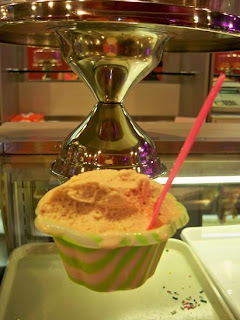 It bothers me when gelato tastes artificial, but this one had no traces of unnatural flavors. The ices was also good and quite refreshing on a hot, 90 degree day such as yesterday. Although it wasn't creamy like the gelato, it still contained a good deal of flavor and nice consistency. Crystal was quite happy with it, and judging by her empty cup, I'd say that she'd get it again in the future. Although some of these goodies come at a premium, they are 100% worth it. A small cup of gelato set me back $4 and a medium cup of ices cost Crystal a mere $1.50. Needless to say, the ices was a better value but the gelato was definitely more flavorful. I'd recommend both - as well as any of their other frozen flavors such as pineapple, stacciatella, pistachio, chocolate, blueberry, raspberry and much more. I love hazelnut gelato...must give this place a try. I love that the places you review are in the neighborhood-perfect for a evening snack. We've a new gelato/dessert place in Forest Hills as well, but probably not as big as Terrizzi. Can you choose 2 flavors for the $4cup? Yum. Got to run; going to watch Top Chef for a million hours tonight, then go to bed. Thanks Raquel - definitely give it a try, it's really worth it. Gar - not sure if you could choose 2 flavors but I don't see why not. Kablooey - I'm watching it now! also, i really want to check this place out!